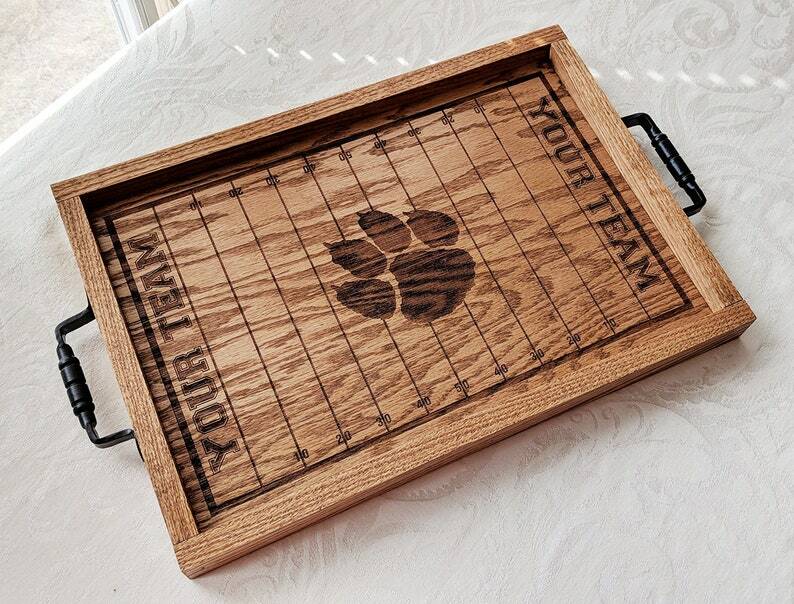 Simply send us a message and let us know what team you would like to see on a serving tray. We'll either send you a proof of the artwork or we'll send you a picture of the finished product if it's a team we've done before. Once you're satisfied with the design, just place your order and we'll be sending your new custom engraved tray out to you in 3 business days or less. We are super excited about our new line of laser engraved collegiate football field serving trays. This is truly a game day must-have for any party host. Not just a functional serving tray but a full blown conversation piece. This tray is made from solid 3/4" red oak. The football field is precision laser engraved. The pieces are then heavily sanded for a super smooth surface and then stained and clear coated for protection as well as a brilliant shine. The handles are forged iron that have been oil blackened for a truly rustic look and feel. Thanks again for viewing our product! Bare in mind that this is not a side job for us. It is our FULL-TIME craft and passion. This allows us to offer you very reasonable turn-around times compared to others that you'll find here on Etsy. The typical lead time is 2-3 business days. Please send us a message with any questions you may have. Matt was great to coordinate with to have a custom toy box- we got the “Olsen” Toy Chest and he was happy to change the base color. Our daughter loves it including using the top as a drum. It is gorgeous and arrived very carefully packed to avoid any damage in shipping. It was completed and shipped very promptly. We look forward to using it for years to come! !